Eww. I was just watching a Modern Marvels show on the History Channel about Supersized Food and it’s grossing me out. Is it humorous or sad that the current monstrous state of our food has become a modern marvel? When did bigger become better? What about taste, quality, and culinary execution? Mallie’s Sport Bar & Grill, South Gate MI – home of the 10lb Monster Burger, which gets ordered about 6 times a week. 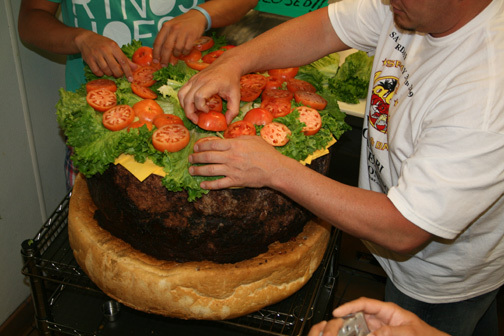 They have a big burger lineup, you see, from a half pound to the ridiculous burger…100lb meat patty with all the fixin’s (8lbs of American cheese, 10lbs of pickles, 8lbs of tomatoes, 10lbs of onions, 5lbs of bacon, 10lbs of lettuce) and measures 26″ in diameter x 1.5ft tall. Some quick math – this burger contains about 150,000 calories. Mallie’s proudly designed and renovated cooking tools in the meat industry to cook this beast, which starts out as a 255lb meat patty before 14hrs cooking time. The bun alone weighs 25lbs. The makers of this ridiculous burger say they do it because they think food should be entertaining. Schmeisers Meats, Chicago IL – They boast a 7lb, 16″ hot dog. smoke house for 3hrs. still working on the bun. slice it into 4″ patty and put it on a hamburger bun. Big Mamas and Papas Pizzeria, Downtown LA – 54 x 54″ giant Sicilian. That’s almost 3000 square inches of pizza. Do you have a double door entry? You’ll need one if you order this pie. It uses 22lbs dough, 5lbs of sauce, 15lbs of mozzarella, and requires 3 adults to stretch it out. It costs $199 and feeds 30 people. The Big Texan Restaurant, Amarilla TX – 72 oz steak= 4.5lbs. If you finish it your meal is free. The meal consists of the steak, a a baked potato, shrimp cocktail, a roll with butter, and tossed salad. All this in 1hr is what they refer to as the Big Texan Challenge, which began in 1962. Those who attempt this are trying to consume in 1hr the amount of beef the average American consumes in a month and a half. Somehow 1 out of 6 contestants comes out victorious. Lulu’s Bakery, San Antonio TX – 3lb cinnamon roll. It takes 1 gallon sized bowl of yeast, 40lbs of flour, 4lbs of shortening to make the dough that stretches 6ft length. 1 batch giant rolls calls for 2 cups cinnamon. They use 3500 lbs of flour, 2500lbs powdered sugar, 2000lbs of sugar, 250lbs of margarine per week. The icing is 15-20lbs of powdered sugar into 1 quart water. La Provence, Beverly Hills CA -Jumbo cupcakes which serve up to 10 people. They sell about 50 per week. The recipe includes 80lbs batter for 10 jumbo or 500 individual cupcakes. Entry filed under: Restaurants, TV. Tags: Big Mamas and Papas Pizzeria, La Provence, Lulu's Bakery, Mallie's Sports Bar & Grill, Modern Marvels, Obesity, Schmeisers Meats, The Big Texan Restaurant. Blue Gold: World Water Wars	What’s Wrong With Our Food System? Childhood Obesity Is One Of The Most Stern Civic Health Challenge Of The 21st Century. The Trouble Is Global And Is Steadily Affecting Many Low- And Middle-Income Countries, Particularly In Urban Settings. The Occurrence Has Increased At An Alarming Rate. Globally, In 2010 The Number Of Overweight Children Under The Age Of Five Is Estimated To Be Over 42 Million. Shut To 35 Million Of These Are Living In Developing Countries. Plump And Obese Children Are Probable To Stay Obese Into Adulthood And More Likely To Develop No Communicable Diseases Like Diabetes And Cardiovascular Diseases At A Younger Age. Overweight And Obesity, As Well As Their Related Diseases, Are Largely Preventable. Prevention Of Childhood Obesity Therefore Needs High Priority. Overweight and obesity are defined as ”abnormal or excessive fat accumulation that presents a risk to health”. The WHO Child Growth Standards, launched in April 2006, include measures for overweight and obesity for infants and young children up to age 5.